I made an impromptu decision last night while watching Booktube-a-Thon TBRs to join in on the readthon! Now I obviously do not have a Booktube channel, so I will not be doing the video challenges, just the reading ones. Anyways, Booktube-a-Thon is a readathon hosted on youtube by Ariel Bissett. I thought it would be a good idea to join to help me catch up with my reading because you’re trying to read seven books in seven books. Like I said, you try to read seven books during the readathon, one book for each challenge. If you have a youtube channel, you can also participate by doing video challenges, or if you have an instagram you can do daily photo challenges as well. So, here are the seven books I have chosen. So for this first challenge, I have decided on Tash Hearts Tolstoy by Kathryn Ormsbee! This book is about a teenage asexual girl who has a Youtube series based off of Leo Tolstoy’s Anna Karenina. Also, Leo Tolstoy is on the cover, so it fits as my book with a person on the cover. I have just started the audiobook for The Hate U Give, but I’m going to use a different book for this challenge instead. Since I’m still on vacation, I don’t have a whole lot of books with me. One pretty hyped book I have is A Crown of Wishes by Roshani Chokshi. I’ve been meaning to read thi forever and while it isn’t super hyped up, I think it is pretty popular, so I’m counting it for the challenge. Considering this challenge is over the course of seven days and I’ll be reading seven books, it’s safe to say I’ll be finishing most of these in one day. For this challenge, I am going with The Bone Witch by Rin Chupeco. It’s just over 400 pages, which is on the longer side, but it’s not bad, so I’m pretty sure I can do it. For this challenge, I’m choosing The Hate U Give by Angie Thomas! I started the audiobook of this months ago and while I was enjoying the story, I’m not the biggest audiobook fan. So now I’m going to try and finish the audiobook. This book is inspired by the Black Lives Matter movement and the main character is a teenage black girl, so she is very different from me. This is easy! Most people are complaining about this one, but I love reading outside during the summer. Especially since I’m on vacation and we have the perfect outdoor reading spots. I am choosing to read Frostblood by Elly Blake. I’ve been meaning to read this book for awhile now and I’m finally going to get to it. I started Our Dark Duet by Victoria Schwab last week and honestly, just got bored and stopped reading. I’m going to finish it for Booktube-A-Thon, which shouldn’t be too terrible because I only have about 350 pages left (I guess that is a lot, but I’ve already read a good 150 pages). Finally, for the last challenge I’m reading Who’s That Girl by Blair Thornburgh. I received this book in a subscription box and it sounds like it will be pretty good, so I’m excited to check it out. Also, the cover is really pretty. Those are all seven books I plan to read (or listen to) for Booktube-A-Thon! I’m really excited to participate in this readathon, and I also plan on doing the Instagram challenges as well. This readathon will really help me get back on track with my reading challenge as well. 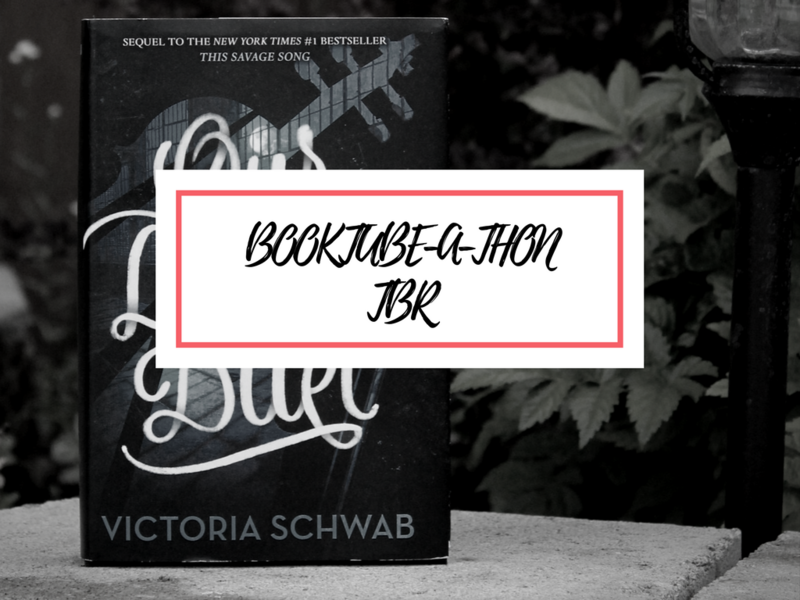 Are you participating in Booktube-A-Thon? If so, which books do you plan on reading? Will the reading a book outside challenge be easy or hard for you? Because I do know most people were not happy about this one. Also, if you have any audiobook recommendations that would be greatly appreciated! I am apparently reading ALL the books…. I should have planned better so more of my books were audiobooks but, you know. I don’t always use my brain, so.